We find it helpful to revisit the basics of endurance training at the beginning of the year when many people are just starting their fitness journey. Last year we covered Heart Rate 101 by clearly explaining the 3 most popular ways to use heart-rate data to improve your running. This year we're going over the basics of running form and how just a few simple tips can greatly improve your speed in longer distance runs. One of the beautiful things about running is that it's an innate skill. You're instinctively hardwired to do it, but in order to run your fastest — you need to put some thought into how you turn one leg over the other. The mechanics of your body in motion is your running form, and it's something you can improve upon with basic know-how, and a little help from technology. First and foremost, understand that your natural running form isn't inherently bad. There isn't a gold-standard that you need to strive to achieve. Ultimately, good form is about applying a few tried-and-true tips every time you run, keeping an eye on your data as a source of feedback on your performance, and making an effort not to let your form deteriorate as you get tired during longer workouts. Many of the problems with running form can be partially corrected by simply holding your body a certain way while running. Starting at your head, make an effort to hold it level, because this will relieve tension in your back. Avoid pointing your chin up or down. If you catch yourself staring at the ground as you run (which isn't uncommon when running uphill), make a point to look up and stare ahead. Try not to lean your head forward, though. Avoid slouching and run tall. Your back should be straight. Keep your head over your shoulders, and your shoulders over your hips. 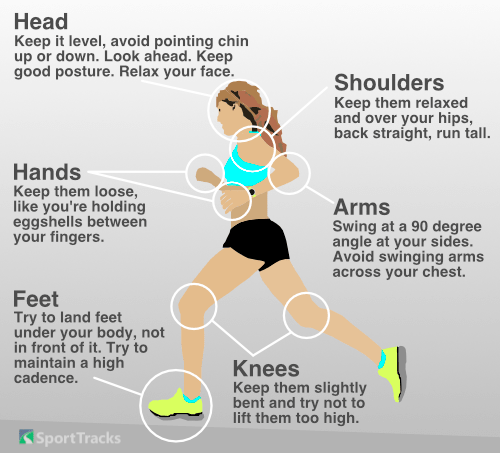 We tend to focus on our legs and feet when we run, but it's equally important to keep your upper body relaxed. Make an effort not to clench your jaw, or to hold a grimacing or tight expression on your face. Straining these muscles wastes valuable energy that could otherwise be used for speed and distance. Okay, okay. What about my lower body? You might assume this section would be somewhat complicated, but it's not. The advice here is very basic. Make an effort to have your feet land under your body, rather than in front of it. Landing in front creates a damaging impact that your body must absorb, and it acts as a braking force that slows you down. Another simple tip is to try not to bend your knees too much. Keep them slightly bent, but don't overdo it. There's been a lot of talk over the years about which type of footstrike is most beneficial. Some people believe that heelstriking is bad, and that it's better to land on your midfoot, and have more of a gliding form. The latest research suggests that rather than worrying about footstrike angle, you should mostly concern yourself with cadence, which is the number of steps you take per minute. Tracking your cadence is best achieved with a GPS running watch. It's a number you can see by quickly glancing at your watch as you run, and you can analyze it in training software afterward. For a long time it was thought that every runner should strive to have a cadence of 180 SPM (steps per minute). However, seeing as we all have different length legs and various goals for distance and speed, having a universal goal of 180 SPM doesn't make sense. In general, you want your cadence to be high. You want to have your legs turning over fast enough that your body stabilizes when running. Slower cadences are less taxing physically, but they tend to be bumpier and more jolting to your body. The key is to get your cadence high enough that your run smoothes out. When this happens, it doesn't matter where your footstrike is landing, as long as your overall run is smooth and stable. And... That's about it for the basics of running form! This is an area you can get more into with advanced hardware like the Stryd running power meter and RunScribe wearable run analysis sensors. These devices track a number of different running efficiency metrics, all of which you can view and analyze in SportTracks. You can also learn more about running form from our articles about Vertical Oscillation and Ground Contact Time. We hope these tips are helpful, and give you a more efficient and injury-free gait! Now that you’ve got pace zones what are you gonna do with them?